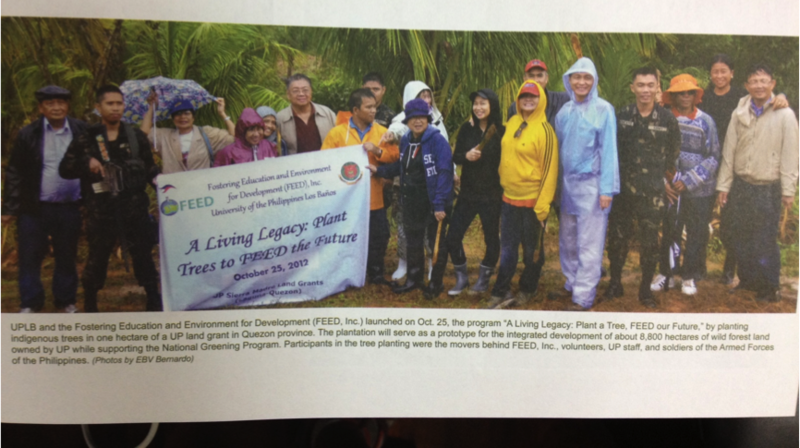 2012 FEED & UPLB partner with AFP to Plant Trees | FEED, Inc.
December 12, 2012. Siniloan, Laguna. Fifteen elementary school children from Siniloan, 35 AFP soldiers, 30 local contract farmers from the region and 5 FEED board members pulled off planting a record 1600 seedlings in 2 hours at the Laguna Quezon Land Grant Development project site, the second hectare to be planted out of approximately 8,800 hectares to be developed into sustainable agroforestry, farming and livelihood based plantations for the benefit of the community. The seedlings varied for mixed cropping purposes, with the intent of yielding immediate (3-6 months vegetation and fruit-bearing) up to mid- and long-term results (indigenous woods of 1 up to 3 years growth). UPLB & FEED designed a mixed crop farming system in which two or more types of crops are raised within the same area. Eventually, the plan is to also include aquacultures and livestock development to take advantage of working with the natural habitat. The mixed crop farming method is important to agro forestry and the natural ecological systems, designed to optimise and sustain production that delivers socio-economic and environmental benefits to all UPLB Land Grant users. The Laguna-Quezon Land Grant Development project is designed to support varied production of food, medicinal trees and herbs, crafts and building materials and sustainable livelihood development of the local/indigenous community, for market and public benefits. The system has been managed with success at the Laguna Land Grant area as a means to engage farmers and increase their income by also reaching different markets, through improved farm methods and production diversification in order to avoid market fluctuations. By optimising land use and agro-forestry and farming techniques guided by the UPLB, farmers are also able to minimize exposures/expenditures in materials and making use of marginalise land (e.g. off-season). 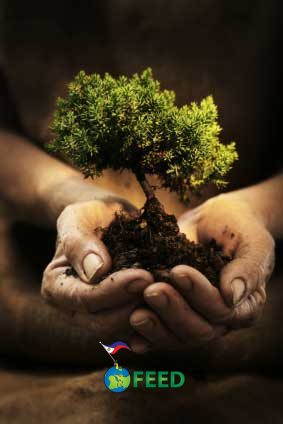 The 2012 launched LIVING LEGACY program will continue into 2013 with monthly tree planting activities with UPLB and the AFP, and buy involving various members of the community in order to help raise awareness about the importance of biodiversity, the environment and food security. October 25, 2012. Siniluan. 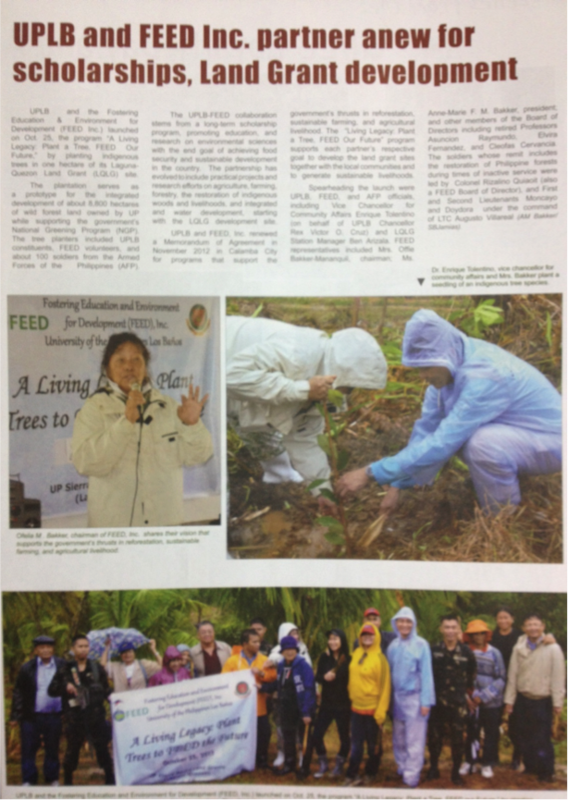 The University of the Philippines Los Baños (UPLB) and Fostering Education & Environment for Development (FEED) launched the “Living Legacy: Plant a Tree, FEED Our Future” program, in a staunch effort to restore indigenous trees at its Laguna-Quezon Land Grant (LQLG) Development project. The UPLB-FEED program was launched with the Armed Forces of the Philippines (AFP) officials and 160 AFP tree-planting soldiers, whose remit includes the restoration of Philippine forests during times of inactive service. Click here for the full press release: UPLB-FEED Living Legacy – Plant a Tree, FEED our Future. Click here for the full list of the UPLB-FEED Living Legacy FOUNDING Patrons. For more information, email info@feed.org.ph or call +63 917 552 4722. © Copyright. FEED, Inc. 2012-2013. Pingback: FEED Inc. | FEED Inc.